MILWAUKEE, Aug. 17, 2017 /PRNewswire/ -- (NYSE: MAN) – TAPFIN, ManpowerGroup Solutions' Managed Service Provider (MSP) has been named a leader for its ability to deliver immediate value to MSP clients across multiple countries and regions. TAPFIN was identified as a leader in all four focus areas identified by NelsonHall's Vendor Evaluation and Assessment Tool (NEAT) report: Talent Analytics, Multi-Country, Strategic Talent Sourcing and Overall. The NEAT tool allows strategic sourcing managers to assess the capability of vendors across a range of criteria and business situations and identify the best performing MSP partners. "Today organizations are looking for an insight driven, Total Talent Management approach that helps them realize untapped value from all of their people," said Jamiel Saliba, Vice President/General Manager, TAPFIN Global. "We are proud to be recognized as a leader in the industry for our multi-country strategic workforce consulting and unrivalled talent analytics. 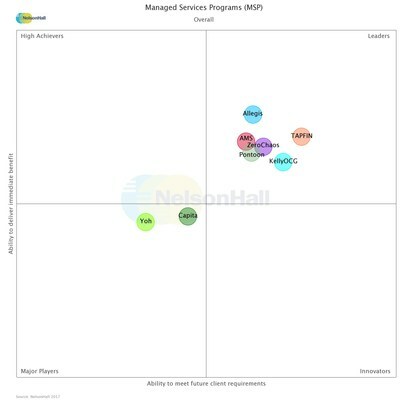 This analysis from NelsonHall and ongoing positive feedback from our clients confirms our ability to deliver leading workforce solutions to organizations around the world." "With regard to meeting their immediate needs, clients scored TAPFIN highly in day-to-day management of the workforce, improved compliance and risk mitigation, and ability to apply VMS technology to streamline and improve processes," said Gary Bragar, HRO Research Director at NelsonHall. "In terms of their ability to meet future client requirements, TAPFIN received high scores in areas including service culture and provision, flexibility of approach, and strength of partnership." For more information about TAPFIN, visit www.manpowergroupsolutions.com. For more information about ManpowerGroup Solutions' recognitions, visit http://manpowergroupsolutions.com/about/recognition. For more information about NelsonHall, visit http://research.nelson-hall.com. ManpowerGroup® (NYSE: MAN), the leading global workforce solutions company, helps organizations transform in a fast-changing world of work by sourcing, assessing, developing and managing the talent that enables them to win. We develop innovative solutions for over 400,000 clients and connect 3+ million people to meaningful, sustainable work across a wide range of industries and skills. Our expert family of brands – Manpower®, Experis®, Right Management® and ManpowerGroup® Solutions – creates substantially more value for candidates and clients across 80 countries and territories and has done so for nearly 70 years. In 2017, ManpowerGroup was named one of the World's Most Ethical Companies for the seventh consecutive year and one of Fortune's Most Admired Companies, confirming our position as the most trusted and admired brand in the industry. See how ManpowerGroup is powering the future of work: www.manpowergroup.com.